Preview: Microsoft Targets Apple, Google, Oracle, VMware? If history is any indication, Microsoft COO Kevin Turner is set to target Apple, Google, Oracle, VMware and other rivals during a keynote today at Worldwide Partner Conference 2012 (WPC12) in Toronto. But more than a rant about beating rivals in the market, Turner and Channel Chief Jon Roskill will likely outline the Microsoft Partner Network (MPN) strategy — both on-premises and in the cloud — for the company’s new fiscal year. Indeed, Turner and Roskill will likely explain how Microsoft will empower partners to build market share with Windows 8, Windows Phone 8, Windows Server 2012, Dynamics and Office 365, among other platforms. Updated: The keynote started at 9:00 a.m. eastern. Here’s a recap of Jon Rokill’s keynote. 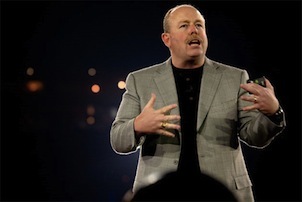 Here’s a recap of Kevin Turner’s keynote. described how Windows Server 2012 is designed for cloud services providers, enterprises and partners. As Five Nines CEO Nick Bock put it, Microsoft is delivering an end-to-end story at the conference, and it’s getting easier to see how each Microsoft offering fits into the larger puzzle. Still, Microsoft has huge work to do in the tablet and smartphone markets. Charles Thomas Gruhler, technology marketing executive and branding strategist, promised attendees that Windows Phone 8 would gain mind share, and therefore market share. But today, the spotlight shifts to Turner and Roskill. Check the blog regularly for minute-by-minute updates.